The National Parks Service (NPS) oversees historic preservation in the United States. What does that mean? The NPS calls historic preservation “a conversation with our past about our future,” which makes it a perfect fit for genealogists. There are three ways the NPS accomplishes their mission: 1.) Designation of historic sites, 2.) Documenting history and 3.) Physical preservation. I have been privileged for the last few years to assist others in the process of documenting the history of properties from downtown business buildings, apartments, commercial districts, homes, government buildings and an entire self-encompassing village. I have helped to conduct historic surveys in two small towns in Kansas that will enable city administrators and business owners to work together to preserve their collective history. I have assisted clients by conducting house / building / property research resulting in over twenty properties being listed on the National and State Registers of Historic Places. The non-profit organization National Trust for Historic Preservation explains on their website that “Old places shape the story of who we are, where we come from, and where we’re going. Historic places tell America’s full story. They inspire us and help us imagine what comes next.” I couldn’t agree more! I have found inspiring stories of business owners lives changed by historic events (Civil War, the Great Depression and WWII), legislative measures (Prohibition and passage of the National Highways Act), and social trends (roaring twenties) that have helped me to better understand what life was like in those times at the personal level. Not just the places but stories of people too — their hopes, dreams, successes and failures – created the foundation on which our country and each of our own lives was built. One of 12 Madonna monuments erected across the United States along the National Old Trails Road by the National Society of the Daughters of the American Revolution (DAR), the Council Grove Madonna of the Trail Monument pays tribute to the pioneer women who helped settle the West. 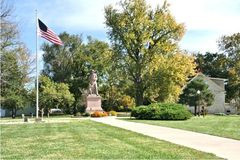 The Council Grove Madonna is one of only three (of the 12) that are specific to the Santa Fe Trail. The monument reflects the early twentieth century movement to commemorate historic roads and trails, a movement initiated by the DAR. The Santa Fe Hospital Association, founded in 1884, built the existing hospital in 1930 to replace a former hospital at this location. 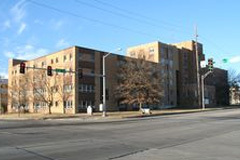 The largest of the railroad’s hospitals, the Topeka hospital not only provided patient care but also served as home to Santa Fe’s Hospital Association, the railroad’s chief surgeon, and the medical dispensary. The hospital signifies Santa Fe’s commitment to the capital city and is a physical reflection of the shared history of Topeka and Santa Fe as the railroad and city grew. The building’s period of significance spans from the building’s construction in 1930 to 1966, reflecting the date of federal legislation creating Medicare and the hospital opening its doors to the public. Renamed Memorial Hospital in 1972 the hospital closed in 1989 after filing for bankruptcy; the last of Santa Fe’s seven hospitals to do so. During its first 20 years the Powell Building was home to three mercantile/general stores but by 1916 it housed the city’s first opera house and theater. By 1919 the theater, called the “Electric Theater,” offered entertainment to the citizens as well as acting as a center for community events such as the Armistice Day celebration at the end of WWI. 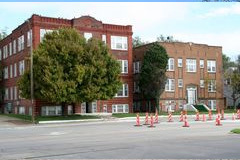 The building served the town’s civic organizations including the Odd Fellows Lodge, the American Legion Post and the Lions Club and also functioned as the city’s community hall for 20 years (1940-1960). 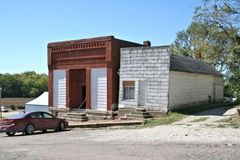 While multi-purpose use of buildings is not uncommon in small towns, the Powell Building is significant in its broad utility for the town, likely touching the lives of every citizen for several generations and as one of the only relatively intact historic commercial buildings remaining in the town of Goff. Michelson Building (Kansas City, MO) National Register Nomination, Washington, DC: National Parks Service, 2017. 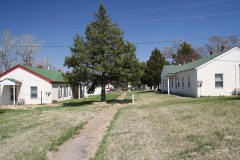 Rosberg-Holmgren-Clareen Block (Lindsborg, KS). National Register Nomination, Washington, DC: National Parks Service, 2016. Shankman Building, (Kansas City, MO) National Register Nomination, Washington, DC: National Parks Service, 2017. Trolley Station, Kansas City-Leavenworth Interurban Rail Line, Fort Leavenworth, Building 275, Historic Survey Report, May 2017.